Due for delivery from 2019 and 2020 respectively, these ships will serve on long-term charter to Norwegian international energy company Equinor (formerly Statoil) in the Norwegian, North and Barents Seas. The ships are currently under construction at Samsung Heavy Industries (SHI) in South Korea, with the construction managed by a specialist project management team from MISC Group’s marine services arm, Eaglestar. The hull of the vessel is designed with superior specification of 30 years fatigue life based on North Atlantic and North Sea trade. 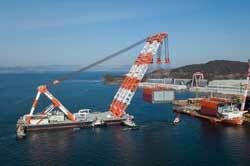 This has ensured that the ship is capable of operating in the most challenging weather conditions. In terms of hull performance, the hull form has been optimised with 2.7% performance improvement from the base model by modifying the hull volume distribution as well as the shape of the skeg, forward and aft hull shape. The twin-screw DPST will be propelled by two low pressure dual-fuel 7X52DF two-stroke engines supplied by Winterthur Gas & Diesel (WInGD) which fulfil the International Maritime Organization’s (IMO) Tier III emission requirements when operating in gas mode and does not require any exhaust gas after treatment system. The DPST is also equipped with an LNG fuel gas supply system and a volatile organic compound (VOC) recovery system. LNG will be used as the primary fuel with marine gas oil as the secondary fuel. The vaporised liquid VOCs will also be utilised as fuel with the mixture of LNG through the fuel mixing module, supplied to the main engine and auxiliary engines, providing a supplementary fuel for a triple fuelled boiler. For operating in the high sea states, the DPST is designed to DP Class Two under DNV GL’s DYNPOS (AUTR) notation and redundant propulsion notation RP (2,50). The DPST is able to maintain station keeping and heading based on environmental forces varying ±12° off the bow with a maximum of 80% of the thrust. In a typical DP mode, the shuttle tanker will operate in two-split DP redundancy mode at low weather conditions and three-split mode in heavy weather conditions to enhance redundancy. The fifth-generation bow loading system (BLS) has been fitted to the DPST for loading cargo from the offshore production or storage facility during heavy weather in DP mode, which is also known as a ‘blue line operation’. The Energy Efficiency Design Index (EEDI) requirements for shuttle tankers are further tested and challenged due to the additional power required for manoeuvring and DP. The EEDI of these DPSTs is an 11% improvement by comparison with the average EEDI of recently built shuttle tankers, and the value comes extremely close to a typical tanker of similar size. Compared with the traditional shuttle tankers, which utilise four-stroke auxiliary engines as the power generating plant, this ship will have two shaft generators driven by the main engines. The combination of the onboard DC grid system and the shaft generator will result in the vessels burning less fuel and generating lower emissions.